The Hours - My Memoir: Ganesha! 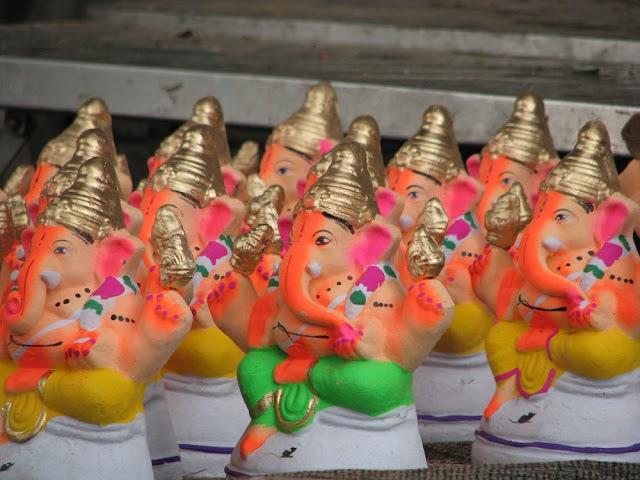 Since several years, I have wanted to capture the images of Ganesha idols sold at RV road and during this Ganesh Chaturthi, I got that opportunity. It was a beautiful sight to watch various forms of the elephant headed God and the excitement in the people and kids to select one for their home. I have a hobby of collecting different types of Ganesha idols. The count is now 20. Several nostalgic moments appeared; thinking of the childhood days when my mother would prepare around 6 varieties of Ladoo, Chakuli, Modka, Yellow coloured dosa and several other dishes. 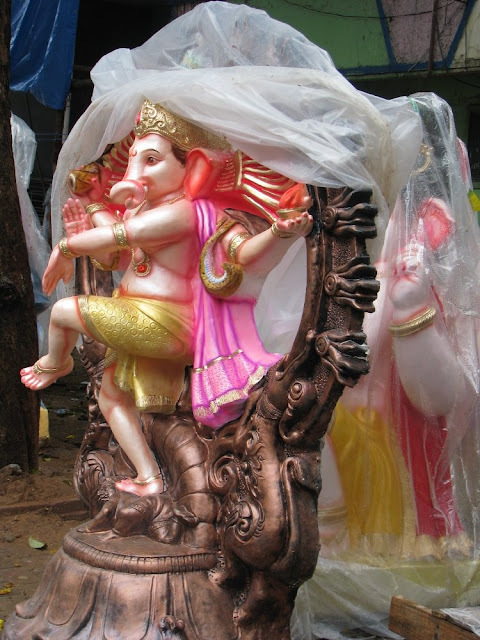 Unlike in Bangalore, In Mangalore Ganesha is not placed in every house, since it is believed that doing so needs a very proper ritual to be followed. Only few families who have been doing this since generations follow it and are not supposed to stop it. At my cousin’s house, which is at a walk able distance from ours, they place Ganesha idol every year and we would go there for the pooja. My main excitement as a kid was to meet my two cousins Anp and Krish. Sitting by the road we would invent new games. Each person would choose a type of vehicle and while it passes by gets a point. With money received as dakshina during lunch, we would buy ice candy or chocolates. After lunch my cousins would come to our house or we would go to the beach. This Ganesha festival, I was lucky to attend the pooja at one of my cousin’s house in Bangalore. Every festival has a memory attached that makes it even more special....It is now I realize how much the festivals are part of we Indians; they are not just another ritual we perform but a pool of emotions, special, joyous moments we have lived and will continue living; it is a celebration of life. No matter how much ever western we get, the festivals will bind us to our roots; our identity. 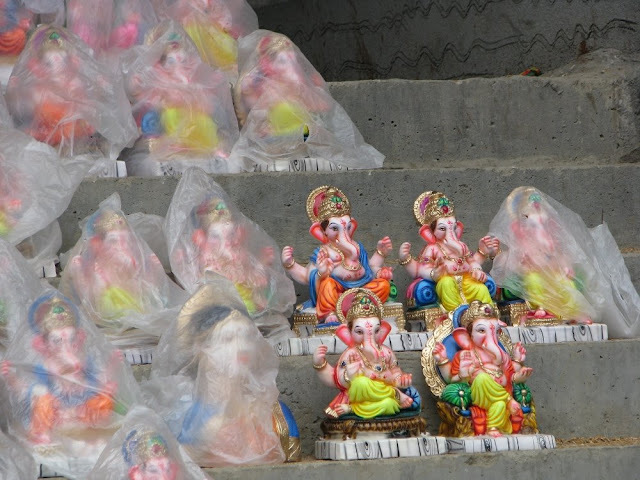 Even I have clicked some Ganeshas this time, will post some. Cuckoo - Let me know when you do. Ganesh chaturthis are always special.. good pics.. 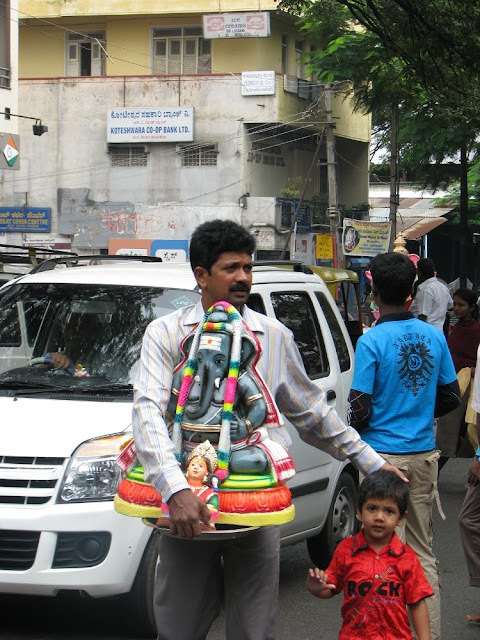 I was surprised when I saw Ganesha festival here, as the idol is kept every other road. We used to count the number of idols we see. more u see, more good it is :) ..
And even now , I keep a count of number of idols I see. @Lakshmi, Mallya, Raji - Thanks. @Reborn - Haha...here you will have problem counting ...there are several. Yes the procession is fun. @Vishv - Good. its fun aint it? I am sometimes tempted to look at it this way: Festivals are a good opportunity for photography! :-) Yes, Festivals are a good opportunity for photography also!!! 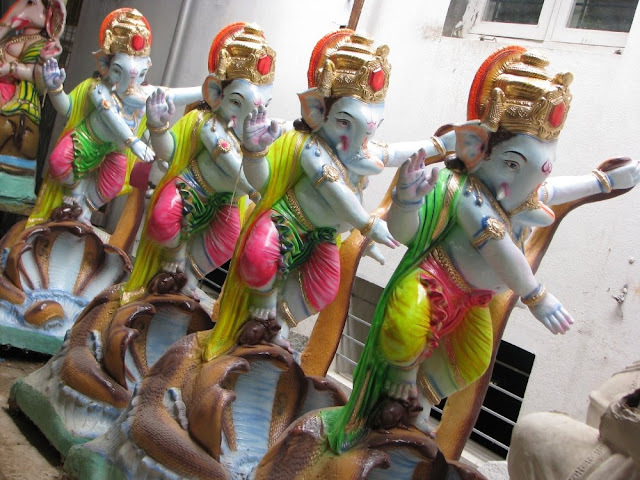 Lovely Ganesha idols, you must look at singer Sudha Raghunathan's ganesha collection sometime. I've ehard she has more than 100 or so now. Well said on your last line, wherever we are, our culture will bind us with these festivals. I love Ganesha and I have collected about 65 so far, each one of them is special to me... He is so cute and adorable, I always wonder how it is really possible to leave Him in water bodies to disintegrate just like that.I also dont like street smart kids keeping Him on roads and collecting money. @Mitr - Thanks and interesting info abt the singer. @Srinivasan - True, Ganesh a cute. 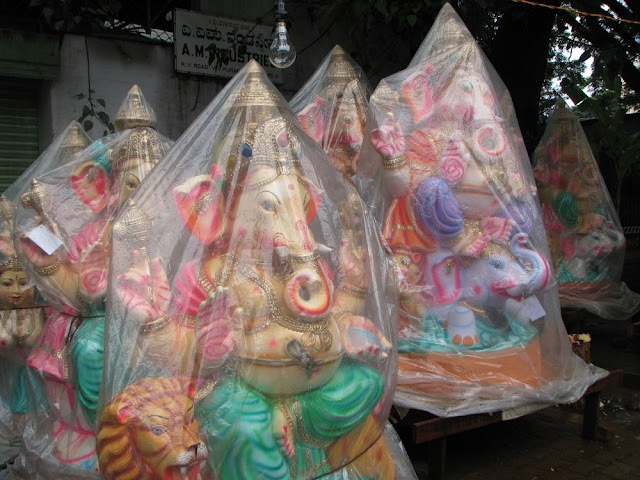 I appreciate the fact that the idol is dropped into the water with an interesting thought that, Ganesh will absorb all the evil from a city or home and as the clay dissolves so does the bad omen with it.